Unforgettable me is your own personal life recording service. Now that you are here let's get you started recording some life data with our Android App. 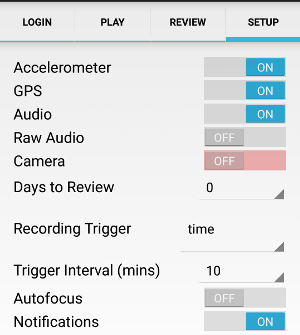 Our Android App can record things like your location (GPS), movement of the phone (accelerometry), and snippets of obfuscated audio. With this data, the Unforgettable Me system can label parts of your day (were you at a cafe, in car, and so on). You can then access and perform searches on your life data in the "My Data" section of this website. Once you have downloaded our Android App you will need to login to it with the same username and password you that used on this website. We've got an iPhone app on the way! When it's complete, an email notification will announce that it is available.